In the late 40s, or maybe early 50s, restless Californian surfers needed something to do when the ocean was calm. Barefoot, beneath the Venice Beach palms, their surfboards dry and discarded, they took to square wooden boards with roller skate wheels attached. "Sidewalk surfing" was born. The sport's oscillating popularity aside, skateboarding has left an indelible mark on American, and world culture. One of the clearest markers is the crossover of shoes used for skating, and specifically-manufactured skate shoes in non-skating scenes. At the same time, non-skate shoes have also played their part in the development of skate shoes. Certain skate shoe brands, in seeking to create the most able skate shoe, not only created the greatest skate shoe but some of the best shoe designs. In this article, we’ll go through five of the most iconic designs that revolutionised the skate shoe. It was from Chuck Taylor’s improvements on the form of the Massachusetts-based Converse Rubber Shoe Company’s “Non-Skids” that possibly the most iconic shoe ever made was conceived. Since 1932 Taylor’s name and signature have adorned an ankle patch, designed to provide greater ankle support, in homage of the man who helped perfect its sporting potential. Anti-slip and flexible, the All-Stars’ vulcanised rubber outsole lent itself perfectly to the demands of early skateboarders, in the era before grip-tape. The higher top provided more ankle support than other available shoes, and the canvas was appropriately light and breathable. The All Star shot to fame through its popularity amongst professional basketball players and was soon worn by Olympic athletes. Even American troops began to wear them whilst training during WWII. The shoe was, over time, assumed by various subcultures, from grunge to art, fashion to film. Presley, Cobain, The Ramones; the list of celebrated names associated with the shoe is extensive. For the longest time, the shoe was the mainstay of skaters before the conception of purpose-made skate shoes. All but a few skaters have moved on, however, the effect of the All-Star upon the image and the culture of skateboarding is undeniable. By the time 1965 rolled around, skating had developed a national presence. Featured in Skateboarder Magazine, the Randy 720 broke as the first ever purpose-designed skate shoe. The Randolph Rubber Company, another Massachusetts-based organisation, recognised the need for a shoe with a tough yet flexible sole, with heel and toe support, specifically designed to take on the rigours of skateboarding. Their answer was the 720. Coming in White-Navy and Loden Green, with a distinctive white outsole, the 720 set the precedent for simple, low-profile, designs. Indeed, a couple of Randy’s employees, James and Paul Van Doren, would go on to perfect the minimalistic skateboarding shoe … but let’s not get ahead of ourselves. Skateboards at the time hadn’t developed much further than planks-with-wheels; kicktails and concave shapes were yet to arrive, which meant that creative expression was limited to carves, wheelies, and the occasional handstand (for the daring). Whilst some had taken to wearing Converse All-Stars, a lot of skateboarders still practised barefoot. The 720 was marketed at preventing the cuts, bruises and broken toes that inevitably followed. The Randy 720 can, and probably should be considered the mother of all skate shoes, particularly from a design perspective. Making shoes that were reinforced by “TUFFER” outsoles, thanks to RANDYPRENE rubber, the Randolph brand didn’t last very long … but from it, came one of, if not the, biggest name in skatewear. Note: here’s our depiction of the shoe. As you can see, it’s quite similar to a modern day Vans classic. Unfortunately, no photos exist of it; we do, however, have access to the original 1965 ad. The Van Doren Rubber Co. opened their doors on March 16 1966, at 704 East Broadway in Anaheim, California. Two former Randolph Rubber Company employees, James and Paul Van Doren -- along with two friends, Gordon C Lee and Serge D’Elia -- manufactured shoes and sold them directly to the public. On their opening day, the company had only made display models: the boxes that lined the racks of the 400-sq ft store was empty. 12 customers came in, and after they had chosen their desired style, they were asked to return in the afternoon as Van Doren and Lee rushed to make their shoes at the factory. When the customers returned to pick up their new shoes, it dawned on Van Doren and Lee that they had forgotten to make money available for spare change. The customers were allowed to leave with their shoes and asked to return the next day to pay for their unique designs, ranging from $2.49 to $4.99. They all did. A lace-up, double-stitched canvas upper with padded tongue and lining rests atop Vans’ patented diamond waffle sole, marrying a lightweight shoe with an extreme grip, and durability. Vans would truly adopt skateboarding in 1975. The #95 (now known as the Era), designed by Tony Alva and Stacy Peralta, from the 70s skate crew Z-boys, was born, which cemented the brand’s relationship with the skate community. This unassuming, low-profile shoe would go on to become a classic, its silhouette inextricably linked to the development of the sport. Vans would tap into the SoCal skate scene whilst becoming a billion-dollar brand. Now, Vans is possibly more than a household name when it comes to skate shoe brands, possibly the most recognisable. 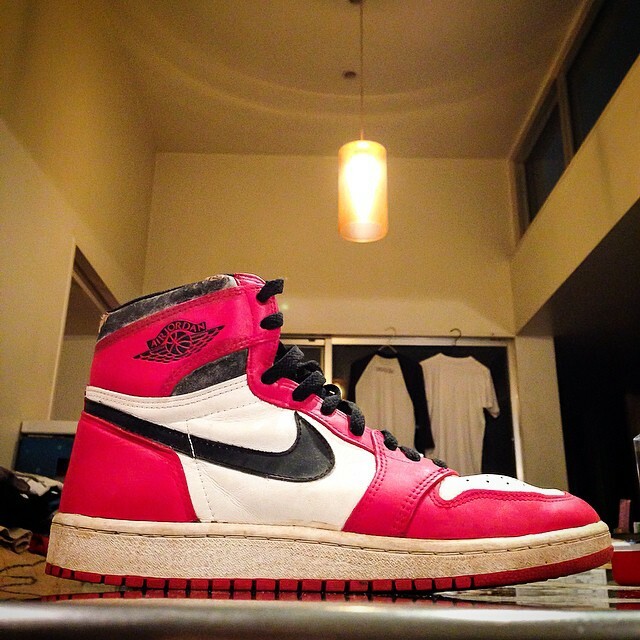 When the Nike Air Jordan 1 dropped in 1984, the design was almost nearly dropped entirely. The story goes that as soon after their namesake, Michael Jordan, stepped out in them for the first time, David Stern, the NBA Commissioner at the time, had them outlawed for having too little white on them. Whilst it was, in fact, the Nike Air Ship that was banned, Nike saw the publicity potential and pounced. Cue new colourways with more white and advertising campaigns which utilised the Air Ship’s banning as a promotional tool, hinting at an “unfair advantage” wearers of the Air Jordan 1s would have over other players. As well as this, a hint of edginess, associated with outlaw activities, served to bolster the sneaker’s popularity. Perhaps the rogue connotations helped Nike and their Air Jordan 1 burst into the skateboarding scene. 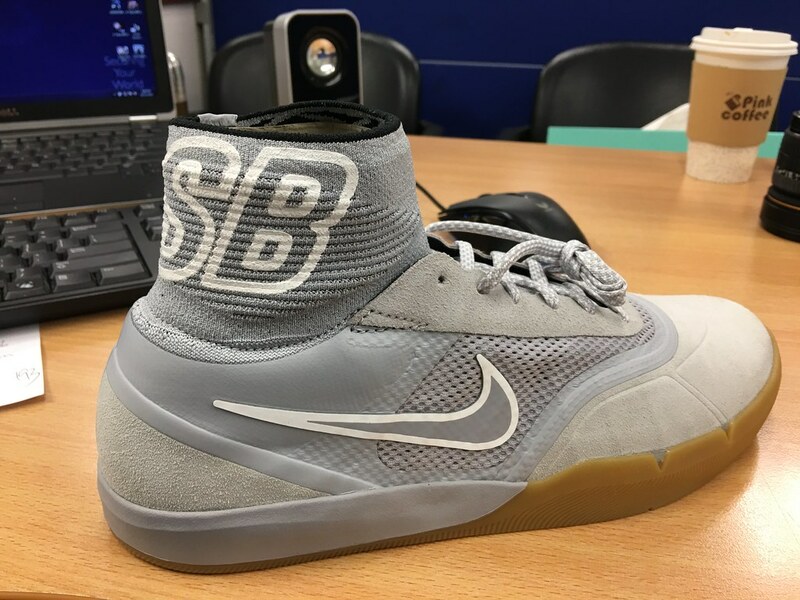 Of course, the main focus was on the shoe’s usefulness as a basketball shoe, however its versatility and aptitude in skateboarding in undeniable. It is only recently that Nike has figured in the list of purpose-built skate shoe brands, yet in the Air Jordan 1, they created a great skate shoe. You could be forgiven by reacting to what looks like the lovechild of one of Ridley Scott’s Xenomorph nightmares and an 80s Nerf gun with bewilderment. The Osiris D3, designed by David Mayhew, a relatively little-known skater from Wisconsin, was the third shoe he had designed for the brand. He wanted to depart from the usual skate shoe aesthetic and create something crazy ... which he absolutely did. He also created what is considered by some to be the best-selling skate shoe of all time. 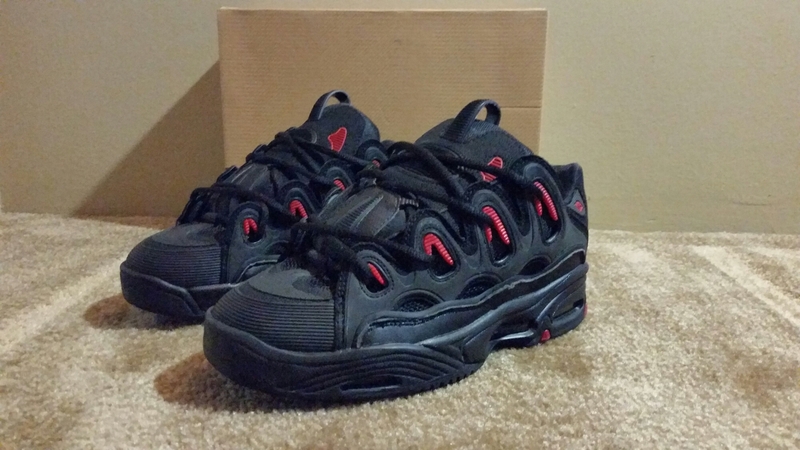 The shoe was awkward, bulky, and had ridiculously large lace-loops (inspired by a hiking boot Mayhew spied when visiting a Sports Authority) as well as absurd stash-pouches. He was sensitive to the divisive nature of the shoe’s aesthetic, however, 6 months after it was exhibited at a trade show, and released in 2000, everything took off … and then almost as soon as it had, it died down again. Yet six years after its initial release, just as the shoe was about to be pulled from the line, the D3’s sales exploded again. Soon stars like Avril Lavigne and Limp Bizkit’s Fred Durst were wearing the D3. Whether or not it was the shoe’s marketability that contributed to its popularity, or that it was a case of the shoe offering the right look at the right time in punk and rave culture is debatable. What is almost universally accepted is their quality and durability, even under extreme use. They are comfortable, generally without having to be broken in, and luxuriously padded, whilst offering great protection and importantly, great ankle protection. These days, Nike SB has paved the way in innovation for skating footwear, firmly establishing themselves as a great skate shoe brand. The Koston 3 Hyperfeel, the latest in a series of collaborations with skating legend Eric Koston, generated immense interest when it was announced in 2016. The most notable design feature is the Flyknit collar, a technical innovation that Nike first implemented in their Magista football boot back in 2012. The lock-in feel around the ankle, paired with Nike’s revolutionary textile, perfects the holy grail of a lightweight shoe and incredible support, with enhanced touch from the ankle down. Whilst putting the Koston Hyperfeel 3s on for the first time might be awkward, they soon mould to the foot. The specialised mechanics don’t stop there. The “Hyperfeel” concept includes a drop-in Lunarlon midsole with a cushioned heel and thinner toe, creating a better hold whilst ensuring a softer landing after bigger air and tricks. For the outer, the Koston Hyperfeel 3 wears the suede well over time, and the minimalistic design is complimented by a thin, web-rubber sidewall and outsole for flexibility and flick. It’s impossible to conceive of a definitive skate shoe: people will always buy down to their preference, and there are too many different design styles that suit different requirements. The Koston Hyperfeel 3 perhaps marries the most designs together; a silhouette similar to the All-Star from Converse, and the comfort of a low-profile Vans. For an in-depth look at the history of skate shoes, check out our interactive timeline that documents over forty of the best skate shoes to grace the sport over the years!